Visitors to this quiet Toronto crescent would never guess that behind this house’s brick facade, a two-year transformation recently took place. 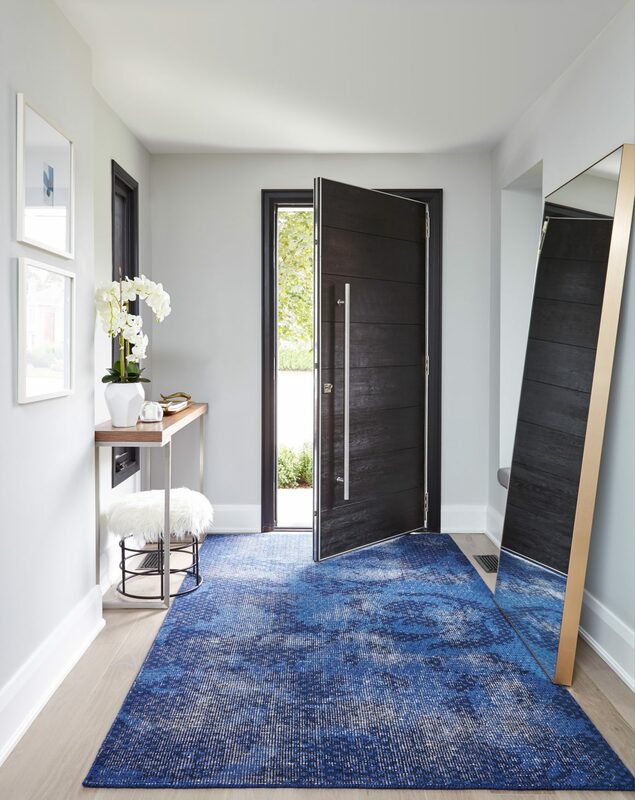 Although the house is not a new build, everything inside was renovated, and a 1,000-square-foot, two-storey extension was added to meet a growing family’s needs. 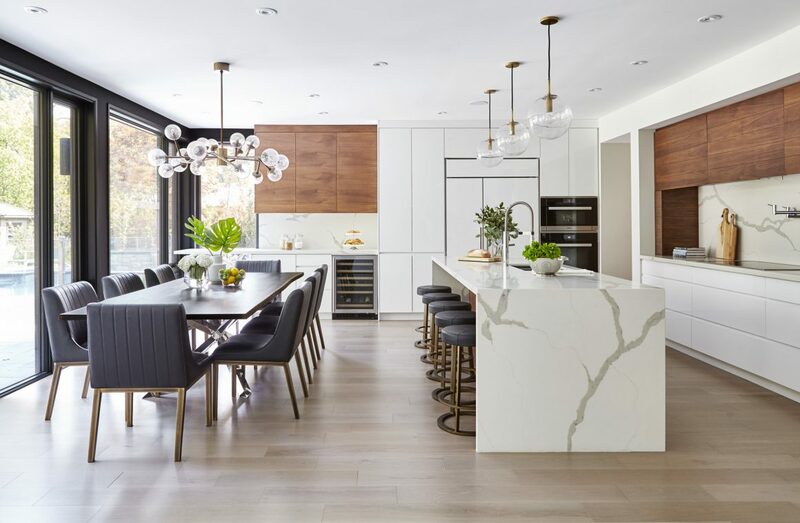 “The homeowners lived here for about a year before the renovation, but they knew when they moved in that it would be gutted,” explains Rania Ismail-Cherry, principal designer and owner of Fohr Design Studio in Toronto. “There’s a little secret area where we’ve tucked away some toys,” says designer Rania Ismail-Cherry. Below the fireplace, deep storage drawers are concealed by beige porcelain tiling. The homeowners craved a sophisticated space where they could entertain family and friends, one that would be comfortable and practical for their two young boys. Architect Peter Higgins re-configured the footprint of the house, bumping up the size to 4,300 square feet. His plans were aptly carried out by builder Z & G Construction Ltd. 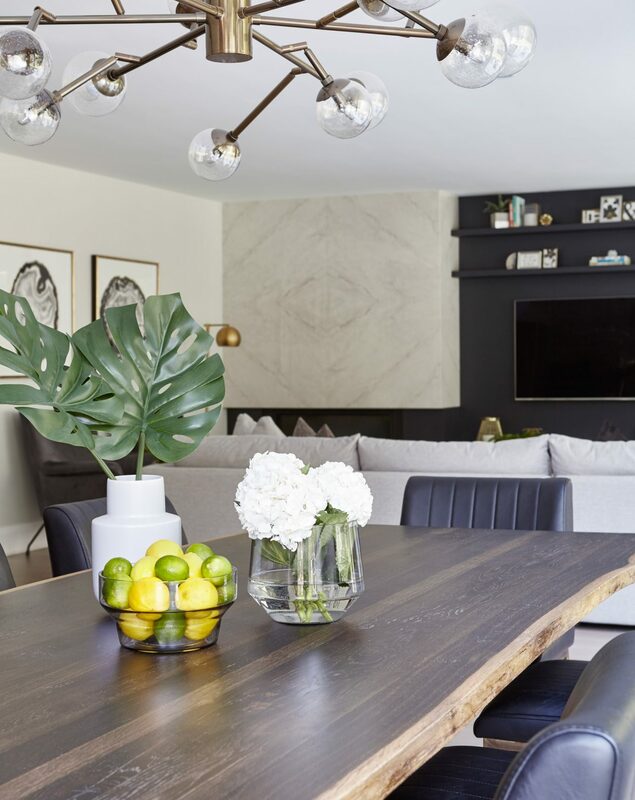 Taking cues from the homeowners’ extensive travels to the Caribbean and California, and with styling help from her colleague Heather Lewis, Ismail-Cherry created a bright, airy space indoors with a laid-back vibe. An oversized walnut slab with a live edge and a sculptural chrome base makes an ideal family dining table. 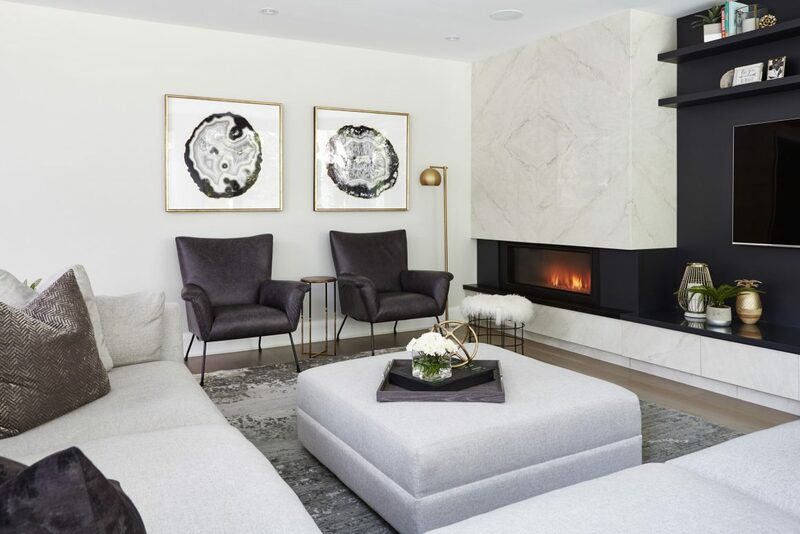 “We used durable materials like engineered white oak flooring throughout the main floor so the kids could run amok, and we placed a lot of emphasis on storage while still keeping it an elegant, grown-up space,” the designer says. Designer Rania Ismail-Cherry left the expansive kitchen windows bare because the homeowners wanted this space to be bright. Everywhere else in the house, she installed blackout blinds and curtains. To maximize counter space at the back-corner window, Ismail-Cherry extended the countertop past the line of cabinetry, creating a little office nook where the homeowners can sit with a laptop and watch the children in the swimming pool. Over the large walnut dining table, the designer hung a large light fixture replete with scattered orbs and burnished brass accents. “We wanted something to dress up the space and give it a bit more sparkle,” she says, noting that the pendant lights over the kitchen island were chosen for their modern look. The original door was replaced by a modern, dramatic front door with a large European-style handle. To disguise some HVAC pipes surrounding the entrance, the walls were thickened, creating an odd little niche that Ismail-Cherry turned into a practical window seat where the children can don their shoes at the front door. Four large pieces of beige porcelain tile were bookmatched to create an eye-catching pattern around the fireplace. Ismail-Cherry also sneaked in hidden storage beneath the hearth, where the children’s toys are concealed behind porcelain drawer fronts. 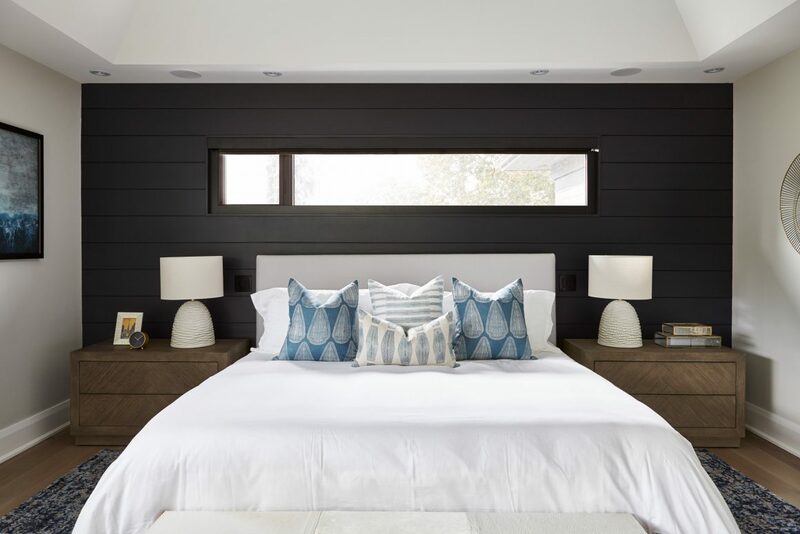 With its 14-foot ceilings and dark feature wall, the master bedroom is a restful refuge. For example, one son’s ensuite bathroom and walk-in closet were part of the existing structure, but his bedroom was in the extension. Building from the ground up left a five-inch difference in the levels, solved by creating a sloping threshold out of quartz going into the bathroom and walk-in closet. A luxurious oasis awaits the homeowners upstairs in their master bedroom, where horizontal windows provide light, privacy, and a lovely view of the trees outside. 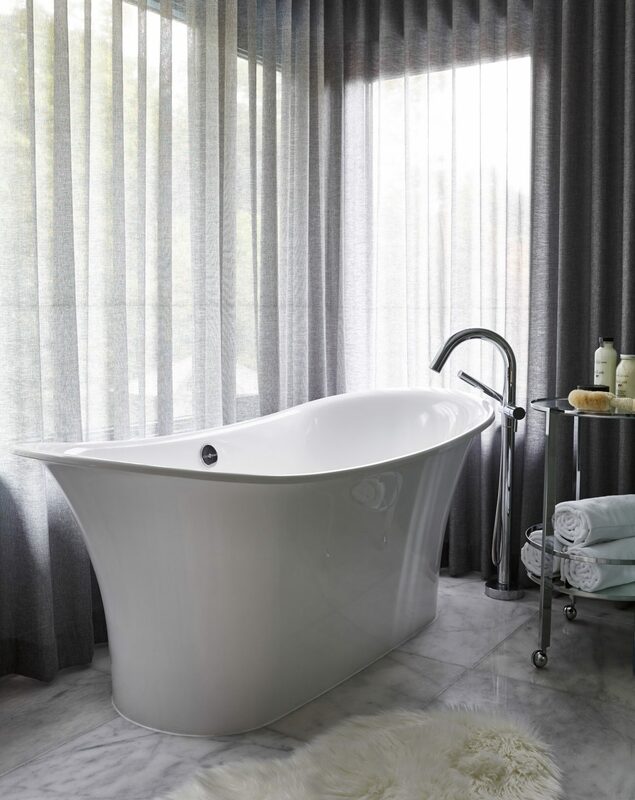 In the adjacent master bathroom, sheer curtains with a chevron herringbone pattern envelop the oversized soaker tub. In the enclosed glass shower, marble flooring is paired with thin porcelain wall tile, bookmatched to resemble one large slab.